The Frugal Family Life: Walmart: Free Tide laundry detergent after rebate! Walmart: Free Tide laundry detergent after rebate! 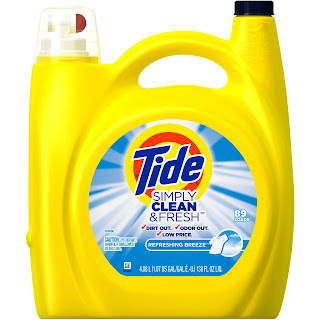 Top Cash Back is offering a $9.90 rebate on the Tide Simply Clean & Fresh HE Liquid Laundry Detergent purchased from Walmart, making it free! This is for new Top Cash Back members only. 2. Head here for the special Tide laundry detergent offer. 3. Order the Tide Simply Clean & Fresh HE Liquid Laundry Detergent priced at $8.97. Make sure to choose FREE in-store pickup at your local Walmart. DO NOT ORDER anything else. Only order the TIDE laundry detergent or the deal will not be valid. 4. Within 21 days of picking up your laundry detergent from Walmart, your Top Cash Back account will be credited $9.90--just enough to cover the detergent plus tax. 5. You can then choose to transfer it to your bank account or request a Paypal payment.